IN ONE VOLUME!Half a decade after the Dominion War and more than a year after the rise and fall of Praetor Shinzon, the galaxy’s greatest scourge, the Borg, returns to wreak havoc upon the Federation — and this time, its goal is nothing less than total annihilation. From that terrifying flashpoint begins an apocalyptic odyssey that will reach across time and space to reveal the past, define the future, and show three captains that some destinies are inescapable. For Captain Jean-Luc Picard of the U.S.S. Enterprise, defending the future has never been so important, or so personal — and the wrong choice will cost him everything for which he has struggled and suffered. For Captain William Riker of the U.S.S. Titan, that choice has already been made. Haunted by the memories of those he was forced to leave behind, he must jeopardize all that he has left in a desperate bid to save the Federation. And for Captain Ezri Dax of the U.S.S. Aventine, whose impetuous youth is balanced by the wisdom of many lifetimes, the choice is a simple one: There is no going back — only forward, to whatever future awaits them…. "From start to finish, the Star Trek Destiny trilogy delivers one of the best 'apocalypse' sagas the Star Trek novels have ever spawned." "Gods of Night opens this dazzling trilogy that encompasses every generation of TV Star Trek (and beyond) … Despite juggling a huge cast of characters — a facet of the trilogy throughout — Mack never loses the reader in the story's labyrinthine twists and turns." "Continuing with the Hernandez storyline, I really liked the big old-fashioned space opera/adventure feel of it, with its mysterious and powerful aliens, and the huge, scientifically advanced alien cities. … The Caeliar world has a good, old-fashioned SF alien feel about it, and it's fun to find a big exploration and adventure story as part of what so many people think will be a Borg overdose." "This is how to do a Star Trek crossover. With epic scope, intensity, and raw emotion, Gods of Night is a powerful beginning to a story that looks likely to have real consequences for the Star Trek universe. Not to be missed." 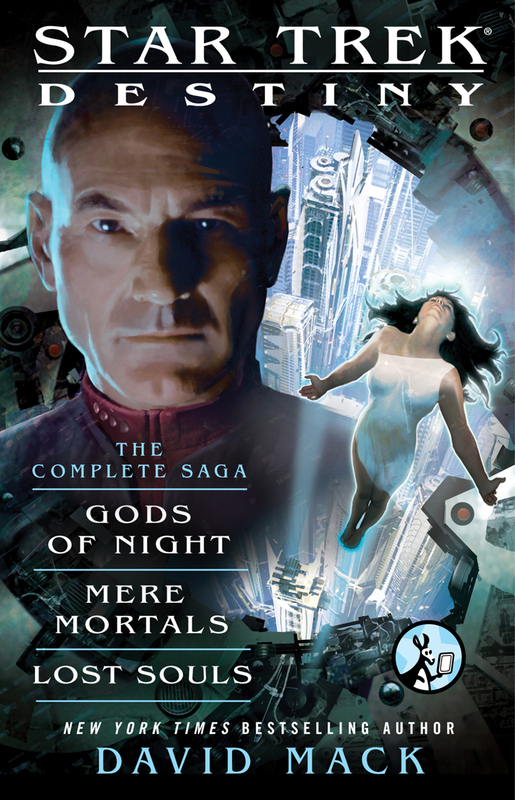 "Gods of Night contains everything great about Star Trek — advanced technology, intrigue, drama, relationships, danger, action, mystery, aliens, time travel, and blowing stuff up. Ending in a mild cliffhanger, readers will want to pick up the next, Mere Mortals, as soon as possible. With an exciting story, wonderful characters, and insurmountable odds to overcome, this is a trilogy no Trek fan will want to miss." "In Mere Mortals, Mack cranks up the pace still further … Once again, Mack delivers a powerful tale echoing many facets of the Star Trek shows, not least the desire for humans to be free, established from the saga's earliest days, through to events of a far more personal dilemma faced by Will Riker firmly on a par with the first episode of 'The Best of Both Worlds.'" "This trilogy combines everything that's great about the last few years' worth of Star Trek novels … It's a mature and powerful work that would surprise the hell out of people who are dismissive of Star Trek novels, if they'd give it a chance." "Mack captures the very voice and nuance of all these familiar characters and takes the reader on a rollercoaster ride of excitement, adventure, mystery, and scientific discovery that covers nearly 800 years of human history." "Star Trek Destiny … is an astounding achievement in Trek storytelling that could have been accomplished only by a sci-fi author of Mack's caliber." "Star Trek Destiny measures up to its promise throughout, delivering a story that encompasses all that Star Trek stands for and giving the reader a gripping adventure reveling, ultimately, in the very best of human nature. With a superb plot, powerful storytelling and well rounded characters throughout — from the lowliest MACO to the most senior commander — Mack, and all those involved in its creation, should be congratulated wholeheartedly for giving readers a page-turning adventure of truly epic proportions." "This is by far the best book in the trilogy. Taking the reader through a wide range of emotions, Mack has wrapped up the Destiny trilogy in an amazing web of storylines that connect in an unpredictable way. Lost Souls has become one of my favorite Star Trek novels, with a shocking ending that will affect the entire Trek universe. Trek fans must read this fantastic trilogy." "Mack successfully manages to mix hard-hitting action with a deep personal element that leaves you caring for the characters and their fates. And Lost Souls is no exception." "It's a very fast-paced read that thrusts you right into the middle of the action, and Mack never lets up for one minute. … The human element is what makes for a successful Star Trek adventure, and David Mack capitalizes on the human factor in this series like never before." "Similar to the final epic Battle of Pelennor Fields in The Return of the King, the final chapter of Tolkien's The Lord of the Rings trilogy, Mack skillfully moves between hard-hitting action and personal drama in creating a battle for the ages. … an epic final chapter to a stunning saga … It's without a doubt the Star Trek equivalent of Tolkien's masterpiece." Voted "Best Story of 2008"